The Space of Culture was shining one more time with colorful paintings by the creative artist and educator Gerlinde Wendland. 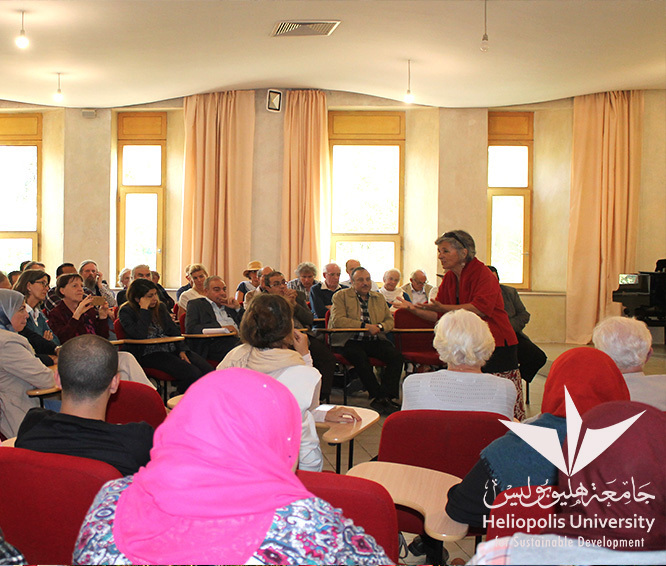 Under the patronage of SEKEM and Heliopolis University, the art exhibition was held at the main hall of the university’s Business Department. During the exhibition opening, Gerlinde Wendland stressed on how nature impacts our thoughts and actions. “The sunlight, for example, can strongly influence my choice of colors. That’s why my paintings in Germany differ a lot to those I drew in Egypt – the sun looks very different over there,” the artist said during her speech. “Also, the way I reflect on nature varies from one day to another. This reveals in my drawing. Hence, each painting is a completion of its predecessor and the beginning of its successor,” she explained. For the last 25 years, Gerlinde Wendland regularly visited SEKEM and Heliopolis University and created many artworks that can be found in all their buildings. That has attracted many participants from SEKEM and Heliopolis University who were curious and delighted to meet the artist.